The Tel Aviv supergroup Eatliz, has already gained some serious attention, due to their award winning video of Hey (which won many festivals, and received a prize directly from Spike Lee himself), and Attractive, is now relasing a new EP. Hey was also selected to be screened before the blockbuster Avatar, in the Cinebarre cinema network in Carolina. Both songs mentioned, are taken from their debut album Violently Delicate, that was released back in late 2007. The album was a strange yet powerful mixture of styles, that somehow managed to make sense (Metal and bossa?? pop and surf?? 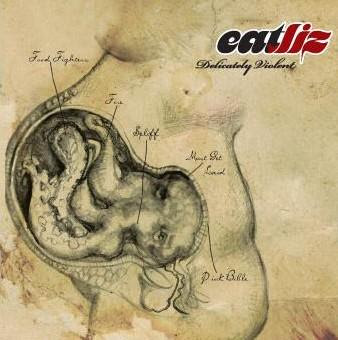 ), and create a sound that is definitly – Eatliz. The band exists for seven years, and they are considered to be one of the most promising alternative rock in the country. Now, they are releasing a digital EP, which is also sold on plastic in the band’s shows, titled Delicately Violent. The titles is no surprise, as it shows the band awkard way of looking at the world. The EP consists of seven songs, somewhat outakes from their debut album. Half of the EP was given away for free, (same with the debut album), upon joining their mainling list, is not anohter compilation of relics that were left on the editing floor, but rather a solid ‘chapter 2’ for their debut. The band is now working on finishing their second album, due to be released in Israel in mid 2010. The band will also tour in Germany in upcoming May. This entry was posted in Album reviews, Artists review and tagged alternative, Animation, Anova Music, Attractive, Delicately Violent, Eatliz, Hey, small town romance, Spike Lee, Tel Aviv, Violently Delicate. Bookmark the permalink.